Shortarmguy's Crazy Emails: Do you like snakes? 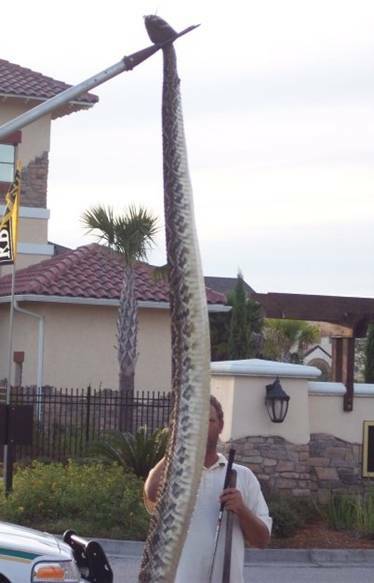 Guess what was found just south of Jacksonville Fl..
Near the St. Augustine outlet, in a new KB homes subdivision. 15 foot Eastern Diamondback rattlesnake. Largest ever caught on record. One bite from a snake this large contains enough venom to kill over 40 full grown men. The head alone is larger than the hand of a normal sized man. This snake was probably alive when George H. W. Bush was President. A bite from those fangs would equal being penetrated by two 1/4 inch screwdrivers. A snake this size could easily swallow a 2 year-old child. A snake this size has an approximately 5 and 1/2 foot accurate striking distance. Judging by the size of the snake, it is estimated to weigh over 170 pounds.